1. A teacher of the second amoraic generation, some of whose halakic deliverances are preserved in the Palestinian Talmud through R. Eleazar ben Pedat (Yer. Ta'anit, i. 64c et passim). He is probably identical with Rabin Saba (R. Abin the Elder) of the Babylonian Talmud, who sat at the feet of Rab, and with the one who is said to have died about the time his son of like name was born (compare 3 below). 2. A Palestinian amora, junior contemporary of the preceding (Yer. Sheḳ. iv. 48c). He is mentioned, together with R. Measha and R.Jeremiah, as carrying on a halakic controversy with R. Abbahu II., R. Ḥanina ben Papa, and R. Isaac Nappaḥa (the Smith). R. Abbahu calls all of the opposition "youngsters"; he nevertheless manifests special regard for the intelligence of R. Abin, to whose approval he refers with satisfaction (B. B. 142b). The same compliment is paid to R. Abin by R. Zeira (Niddah, 42a). 3. 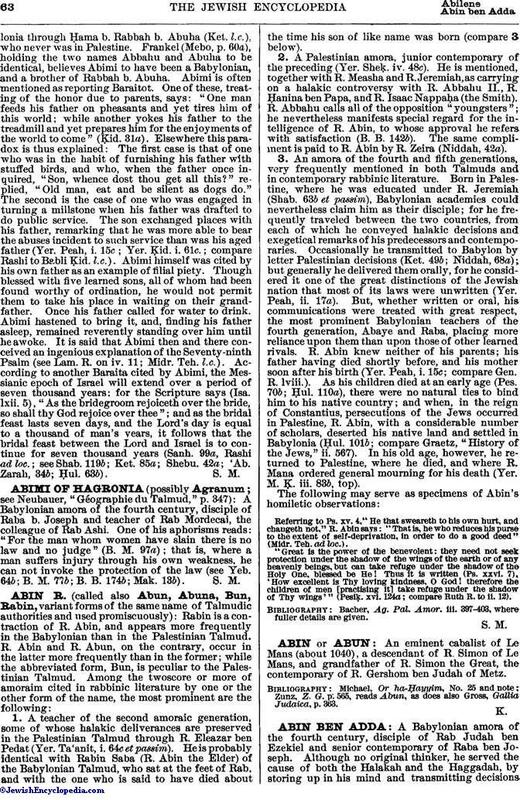 An amora of the fourth and fifth generations, very frequently mentioned in both Talmuds and in contemporary rabbinic literature. Born in Palestine, where he was educated under R. Jeremiah (Shab. 63b et passim), Babylonian academies could nevertheless claim him as their disciple; for he frequently traveled between the two countries, from each of which he conveyed halakic decisions and exegetical remarks of his predecessors and contemporaries. Occasionally he transmitted to Babylon by letter Palestinian decisions (Ket. 49b; Niddah, 68a); but generally he delivered them orally, for he considered it one of the great distinctions of the Jewish nation that most of its laws were unwritten (Yer. Peah, ii. 17a). But, whether written or oral, his communications were treated with great respect, the most prominent Babylonian teachers of the fourth generation, Abaye and Raba, placing more reliance upon them than upon those of other learned rivals. R. Abin knew neither of his parents; his father having died shortly before, and his mother soon after his birth (Yer. Peah, i. 15c; compare Gen. R. lviii.). As his children died at an early age (Pes. 70b; Ḥul. 110a), there were no natural ties to bind him to his native country; and when, in the reign of Constantius, persecutions of the Jews occurred in Palestine, R. Abin, with a considerable number of scholars, deserted his native land and settled in Babylonia (Ḥul. 101b; compare Graetz, "History of the Jews," ii. 567). In his old age, however, he returned to Palestine, where he died, and where R. Mana ordered general mourning for his death (Yer. M. Ḳ. iii. 83b, top). (Pesiḳ. xvi. 124a; compare Ruth R. to ii. 12). Referring to Ps. xv. 4, "He that sweareth to his own hurt, and changeth not," R. Abin says: "That is, he who reduces his purse to the extent of self-deprivation, in order to do a good deed" (Midr. Teh. ad loc.). "Great is the power of the benevolent: they need not seek protection under the shadow of the wings of the earth or of any heavenly beings, but can take refuge under the shadow of the Holy One, blessed be He! Thus it is written (Ps. xxvi. 7), 'How excellent is Thy loving kindness, O God! therefore the children of men [practising it] take refuge under the shadow of Thy wings'"
Bacher, Ag. Pal. Amor. iii. 397-403, where fuller details are given.